Named the "richest little city", it's 4,000 residents welcome over 3 million people yearly making it the most visited seaside location on the Washington Coast. 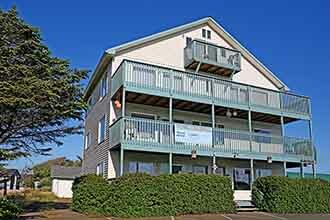 Ocean Shores is a six mile long peninsula bordered by the Pacific Ocean and Grays Harbor. Maybe it's the fact that you can drive your coal, or go horseback riding right on the beach! Or maybe it's all of the fun activities available! Rent mopeds, paddle boats, bikes, or go kite flying, boating, surfing, fishing, clamming, or shopping at local spots. You have to check out places like Flying Cats Gift Shoppe (a quaint local shop right off of Ocean Shores Blvd steps from the Beach.) They make beautiful custom soaps with different scents and translucent colors with cool designs inside, their VERY OWN coffee, yummy gourmet foods(many kosher), and beautiful décor for your home. Ocean shores is also known for it's many antique shops! Here are some reasons why renting a private vacation rental home is just plain better than staying in a cramped expensive hotel room..